NTM‐A/CSTC‐A designates this unclassified document for official use with specific releasability (REL) caveats to NATO and ISAF participating partner nations. a. Mission. NTM‐A / CSTC‐A, in coordination with NATO nations and partners, international organizations, donors and non‐governmental organizations; supports the Government of the Islamic Republic of Afghanistan (GIRoA) as it generates and sustains the Afghan National Security Force (ANSF), develops leaders, and establishes enduring institutional capacity to enable accountable Afghan‐led security. b. 2014 End State. 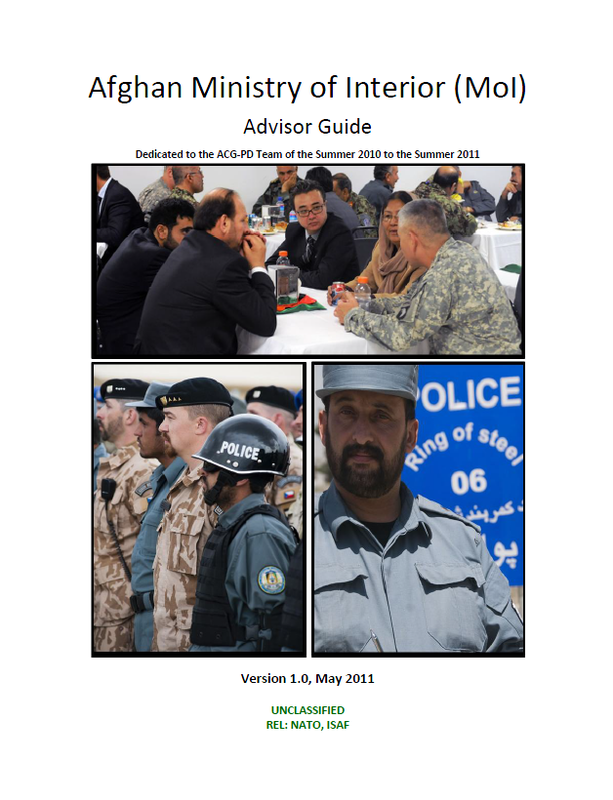 A self‐reliant, professionally‐led ANSF which generates and sustains enduring police, army, medical, infrastructure, and logistics capabilities, with accountable and effective Afghan Ministries that are responsible and answerable to Afghan people. 5. MOI Mission and Vision (From National Police Strategy – January 2011). a. Mission. The ANP is primarily responsible for maintaining civil order and law enforcement. The police will work with the people to actively combat crime and disorder (including terrorism and illegal armed activity); prevent the cultivation, production and smuggling of narcotics; and fight corruption. The police will ensure the sovereignty of the State and protect its borders. b. Minister of Interior Affairs Vision. In five years the people of Afghanistan will consider their police to be a valued institution which is honest, accountable, brave, impartial, and striving to create a secure and lawful society. c. Our (GIRO’s) long term vision is that the ANP will uphold the Constitution of Afghanistan and enforce the prevailing laws of the country to protect the rights of all people of Afghanistan. The police will perform their duties in a professional, non‐discriminatory, accountable and trustworthy manner. d. Civilian Policing. As part of the phased stabilization of Afghanistan with the assistance of the international community, the Afghan National Police are committed to seeking the highest standards in civilian policing in order to guarantee the rights of all Afghan citizens under the Constitution. Civilian policing is a crucial strategic concept that is based on intelligence led, proactive community collaboration. It is aimed at controlling crime, reducing the fear of criminal activity, improving the quality of life of all Afghans, and enhancing the legitimacy of police services. Civilian policing requires greater accountability of police, greater involvement of citizens, and greater concern for human rights.